Small but elegant is the motto here! This lovely holiday house is on the Blandinushof property (approx. 2800 square metres) with a marvellous, partly covered terrace. The interior design has a pleasant ambience as well as all the necessary conveniences. Behind the terrace is a large meadow which is suitable for sunbathing and a wonderful place for children to play. Even your dog will really be able to let loose here. There are also two ponies, chickens and several dogs that live on the property, though separated from the holiday house. Very nice for the kids! The house is in Overlangel near the fortress city of Ravenstein in the municipality of Oss. A visit to Ravenstein is a stroll through the past. You can view parts of the battlements from centuries ago as well as grand monuments that are still intact. With its centuries-old city gates, canals and monumental buildings, the town has a very special feel to it. 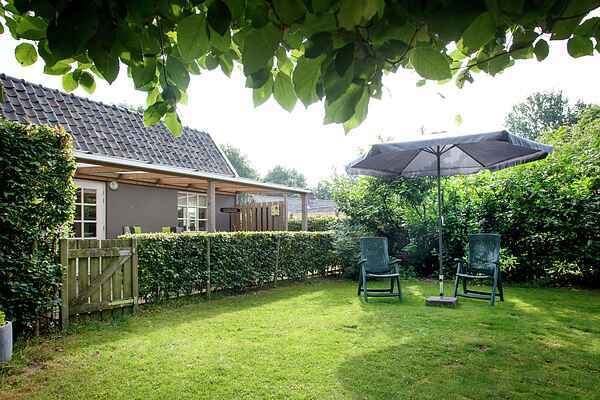 From here you can explore the beautiful countryside of Brabant and take many nice day trips. The larger cities, such as Nijmegen and Hertogenbosch, are easy to reach and definitely worth a visit! Living big in little places! The house has 2 bedrooms, 1 bedroom with a 2 person bed and 1 small bedroom (2.5m x 1.45m) with a bunk bed. It is not suitable for 4 adults, but is perfectly suitable for 2 or 3 adults + 1 or 2 children. Due to previous experiences, the home owner has the right to contact you in order to enquire about the breed of dog you are bringing with you. Based on this information, your booking may be rejected.